I was given the Dove Hair Therapy Nourishing Oil Care Leave In Conditioner ages and AGES ago but actually never used it as it was Embargoed. For some reason I didn't see the point of testing it out until it wasn't embargoed any more! Like alot of things it got lost in my pile of haircare products to review so I sort of forgot about it. A few days before I went away I rediscovered it and thought I'd take it along on holiday to give my freshly coloured hair some much needed moisture and smoothing. 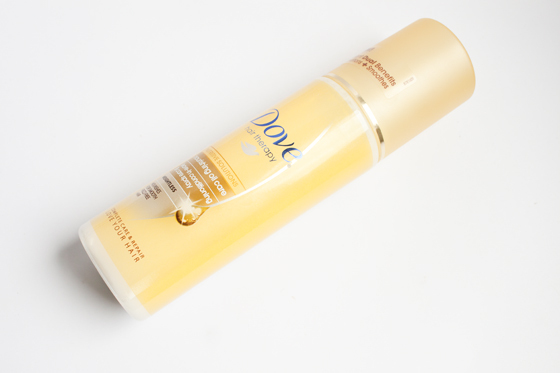 Dove Hair Therapy Nourishing Oil Care is intended to be used as a leave in conditioner, I think it's a hybrid between a leave in conditioner and a hair oil. It feels incredibly weightless on application and doesn't seem to overload with product as its very light. It's never left my hair feeling greasy or slick. The spray comes in two separate liquids, one that sits on top of the other so needs to be shaken before use the emulsify the product for application. The Leave in Conditioner can be used on wet or dry hair, I focus on the tips as they are the driest part of my hair and then would comb through my hair with a wide tooth comb and leave to dry. I used this about twice a day when I was on holiday to make sure my hair wasn't drying out too much from the sun or from the bleach. 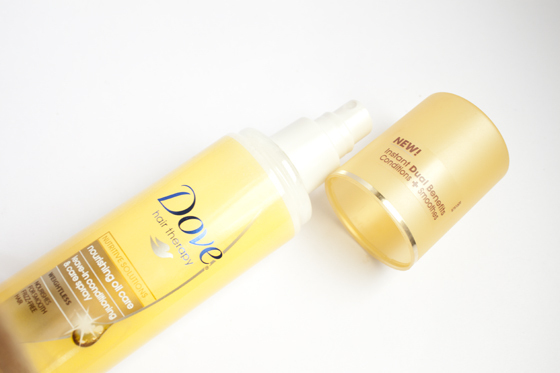 It worked well at keeping humidity frizz at bay and stopped my hair feeling too dry. However I don't think its really done anything towards the long term health of my hair. While I do really like this product and it is great for detangling, smoothing and defrizzing the hair. There are obviously some benefits that instantly improve the hair as it does nourish and smooth on application. I just don't think it really helps the hair in the long run in terms of adding much moisture! The Dove Hair Leave In Conditioner isn't a bad product, for the price it's a very good leave in conditioner and would work well for frizzy unruly hair that needs taming! The spray bottle makes application easy and fuss free, and it does smell lovely. Great information you have shared It will help us to protect our hair from the defective things which we taken and we can control it. Find the best Calcium Hydroxyapatite Manufacturer company to get good quality of medicine .